For most of America, BBQ sauce means a thick, sweet, red tomato based glaze. These types of sauces line the shelves of supermarkets nationwide. However, in certain regions of the country, BBQ sauce is defined quite differently. In the Carolinas, for example, BBQ sauce is of the vinegar or mustard based variety. In a small patch of the deep south (Alabama in particular), BBQ sauce is entirely unique...and white! 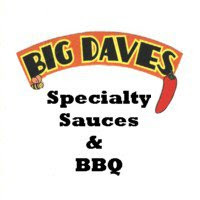 Made famous in BBQ circles by Big Bob Gibson, Alabama style white BBQ sauce has a creamy mayonnaise base and is typically accented by additional vinegar and some sort of spicy element. Saucemaker, Glenn Coleman has elevated the concept to a whole new level with his line of white sauces known as Glenn's Gourmet Goodies. Glenn has created three signature recipes, (White BBQ Sauce, Chipotle and Wasabi) each starting with a soybean oil base. Since they're egg free, the sauces aren't technically a mayo based product. After finding GGG Foods online, I contacted Glenn for more info about his products. I was ecstatic when he decided to send samples of all three sauces for review. I've reviewed nearly 100 different sauces to date, but Glenn's Gourmet Goodies are the first white BBQ sauces to hit The "Q" Review. I did a major chicken cook a few weeks ago and was looking for something different to finish the smoked poultry with. Rather than brushing on another thick tomato sauce, I grabbed a bottle of GGG's Chipotle White BBQ Sauce. GGG's Chipotle is packaged in 16.9 oz (half liter) plastic bottles. This particular sauce isn't exactly white. Thanks to the chipotle powder, the sauce is actually a creamy orange color. Coarsely ground pepper and dark spices speckle the sauce. The sauce is medium-thick and pours smoothly. The white (orange) sauce brushed easily on the chicken. Since the sauce is sugar free, there no threat of it burning. I was really surprised and impressed with the flavor the GGG's Chipotle imparted on the chicken. It was creamy and savory complimenting the herbs in the dry rub. The chipotle powder give the sauce a smokey, spicy finish. I later used the sauce as a dip and again as a sandwich condiment. GGG's Chipotle White BBQ Sauce is incredibly versatile. It's excellent paired with chicken, pork and seafood. It's a fine alternative as a dip or glaze for BBQ and can be substituted in many dishes that call for mayo. GGG's chipotle adds a great deal of extra spice and flavor to burgers and salads. GGG's Chipotle White BBQ Sauce has opened up a whole new world of BBQ possibilities. On the grill, on the smoker or on the side, Glenn's Gourmet Goodies are redefining what a BBQ sauce is (and should be). I can only hope that Glenn's original and Wasabi flavors match the Chipotle. To broaden your BBQ horizons, check out Glenn's Gourmet Goodies' website. See how GGG's Chipotle White BBQ Sauce rates on our "Product Reviews" page. 1 Response to "Glenn's Gourmet Goodies Chipotle White BBQ Sauce"
This is Glenn from Glenn's Gourmet Goodies and I want to thank Derek for his wonderful review of our delicious Chipotle White BBQ Sauce. 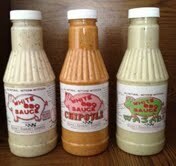 Please go to our website to get our FREE SAMPLE of one each White, Wasabi, and Chipotle White BBQ Sauces. I want to see what new recipes people come up with using our sauces. Thanks again.